Aloe vera originates from the word Alloeh which means shining bitter substance and in Latin, vera means true. 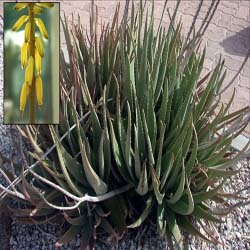 The other names for the plant are elephant's gall, lily of the desert and burn plant. It is not altogether clear which areas the plant is native to. It is believed to be native to Egypt, Mauritania, Morocco, the southern end of the Arabian peninsula, Sudan and the Madeira, Verde and Canary Islands. It was introduced to Southern Europe and China in the 17th century. Today it grows throughout the world. In Ayurveda it is used for the liver, muscle spasms caused during menstruation, vaginal herpes, coughs, congestion, burns, wounds, ulcers and coltis. Use of the aloe vera dates back 6,000 years to Egypt, it was a burial gift for deceased Pharaohs. It was also called plant of immortality and depicted on stone carvings. It was traditionally used to cure wounds and for a variety of skin conditions, it was used orally as a laxative as well. Today it is taken orally to treat numerous conditions, including asthma, diabetes, osteoarthritis, and epilepsy. The gel is also found in many skin products, which includes sunblocks and lotions. Aloe vera has the approval of the FDA (Food and Drug Administration )(FDA) to be used as a flavouring in food. A clear gel which comes from the leaves is used as a topical ointment. The gel that surrounds the green section of the leaf can be employed to produce a dried substance called latex juice which is taken orally. The rind of the leaf is the outer protective layer. The sap is also known as latex or juice. It is a layer of yellow and bitter which protects it from animals. The mucilage gel is the inside area of the leaf which is taken out to make the gel. The inner gel has eight essential Amino Acids which the body needs. All in all the plant contains more than 75 active constituents. It contains folic acid, B6, B2, B1, C and E vitamins. It also contains the following minerals, zinc, copper, iron, magnesium, potassium, chorine, sodium, manganese and phosphorous. A 1999 review by the journal of general practitioners searched for literature of clinical trials. They located 10 studies to review . They used the Cochrane Library, Medline, Embase and Biosis for those searches. They only included controlled clinical trials. If given orally, it could be a way of lowering blood glucose levels of diabetic patients. It may reduce blood lipid levels in hyperlipidaema patients. It may be effective in treating psoriasis and genital herpes. It is not effective in preventing radiation induced injuries. They were not clear whether or not it helps wound healing. They went on to say that these statements come with major caveats. They concluded that the clinical effectiveness of topical or oral the herb was not yet sufficiently defined. A different review done in 2006 found that there was evidence to support the plant maybe being effective for burn wound healing specifically for first degree and second degree burns. Doctors at Obafemi Awolowo University Teaching Hospital, in Nigeria, last year (2012) conducted a preliminary trial of Aloe vera gruel on 10 women who had been diagnosed with the HIV virus. They were given 30-40 ml of the gruel daily. For one year their physical well-being, general improvement and CD4 counts were monitored. Findings were compared with other women in their 20's who were taking antiretroviral drugs, who were also being monitored in the same way. Results showed 4.7kg weight gain for those on the gruel, 4.8 for those on the drugs. Average CD4 count for the gruel group was 153.7, for the drug group 238.85 cells. With the exception of one patient who switched over drugs to gruel, there were no side effects. Doctors concluded that the preliminary data suggests that consuming it might help people who have HIV in the tropics, given it's wide availability and cost. I say not only in the tropics but anyone who can't afford to pay for expensive medical treatment. Topical A.V improves the lives of people who have mild to moderate psoriasis,according to a 2009 article in Journal of the European Academy of Dermatology and Venereology. Take one to two spoonfuls a day with a touch of black pepper. Take 2 spoonfuls 3 times a day. Boil the leaves in some water and breath the vapor. You need a douche, gel, warm water and turmeric. Pour a quart of warm water into a douche, add 2 tablespoons of the gel and around 2 pinches of turmeric. Use every other day for about 4 days. The latex part of the plant should not be used by anyone who has inflammatory intestinal diseases like appendicitis, Crohn's disease and ulcerative colitis. Pregnant women or women who breast feed should not use the latex.